Now this is the Night Ranger we have been waiting for for the last 23 years!!! Good old fashioned American Hard Rock with that West Coast twist!! Since 1997’s “Neverland” the band has been constantly changing and evolving and the evolution culminated in 2007’s “Hole in The Sun”, which was a good album but a little to much of a modern rock feel for my taste. With “Somewhere is California” they went back to their roots and and the result is one of the best albums of their career! 1.) Growin’ Up In California– The first single and album opener. From the very first guitar riff you know exactly what you are in for. A good ol’ hard rocking time!! Definitely sets the tone for the rest of the album! 2.) Lay It On Me– Now it’s time to get hard and heavy! This song hits you like a sack of potatoes in the gut! 3.) Bye Bye Baby (Not Tonight)– Now this is a treat!! Classic Night Ranger! Awesome guitar work! Amazing Song and serious contender for song of the year! Rock doesn’t get any better than this!! 4.) Follow Your Heart– A great mix of classic NR combined with that more modern feel from “Hole n The Sun”, great guitar work! 5.) Time Of Our Lives– The albums one and only ballad and their best one since “Forever All Over Again” from Neverland. Great chorus, wonderful harmonies, beautiful lyrics. 6.) 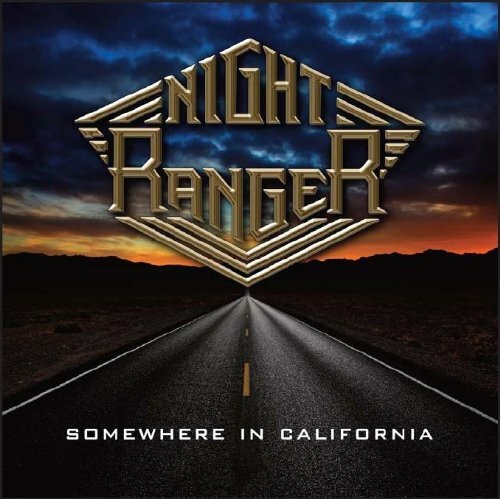 No Time To Lose- All Right, let’s get back to some good old fashion rock’n’roll like only Night Ranger can do it!! Instant Classic! 8.) It’s Not Over– More classic NR, awesome guitar solos! Great Harmonies! 9.) End of the Day– Starts off a little mid-tempo but soon kicks into high gear! More hard and heavy rock! 10.) Rock’n’Roll Tonite– Exactly what you think it is, huge rock anthem!! 11.) Say It WIth Love– The soft keyboard opening makes you think your in for a ballad, but soon gives way to some loud hard guitars! The album ends like just like it began, with great old fashioned rock Night Ranger Style!! If you don’t like this album you are not a real fan of rock music! Instant Classic! !